A solar wind stream flowing from the indicated coronal hole should reach Earth on or about Feb. 20th. . Image credit: SOHO Extreme UV Telescope. The space station is visible in the night sky this month. Would you like to see it? Sign up for Spaceweather PHONE. JUPITER & THE MOON: Tomorrow morning, Sunday, Feb. 19th, if you happen to be awake at the crack of dawn, look out the window. Jupiter and the Moon are having a pretty close encounter. The pair are so bright you can see them even after the sky turns morning blue: sky map. 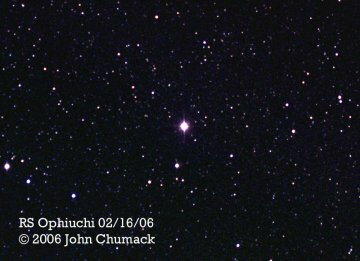 Normally RS Ophiuchi would be indistinguisable from the scatter of dim background stars in this image, but as a nova, it stands out front and center. The explosion multiplied RS Ophiuchi's brightness by a factor of 1700--from magnitude 12.5 to 4.5. "But, cautions Chumack, "the nova is fading now, currently at mag 5.3, so get out and take a look [before it disappears]." "I used a fisheye lens to capture the entire rainbow, which appeared very close to the photographer at one point," says Bush. 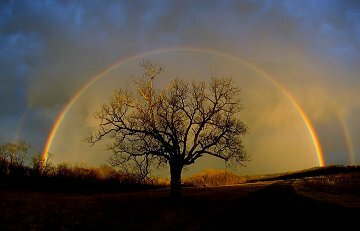 The bright inner rainbow is the primary bow, caused by sunbeams reflecting once inside falling raindrops. It's the bow you usually see. The less-bright outer rainbow is the secondary bow, caused by sunbeams reflecting twice inside raindrops. Secondary bows often go unnoticed, because they are usually very faint, but they are always there. You are visitor number 33760548 since January 2000.